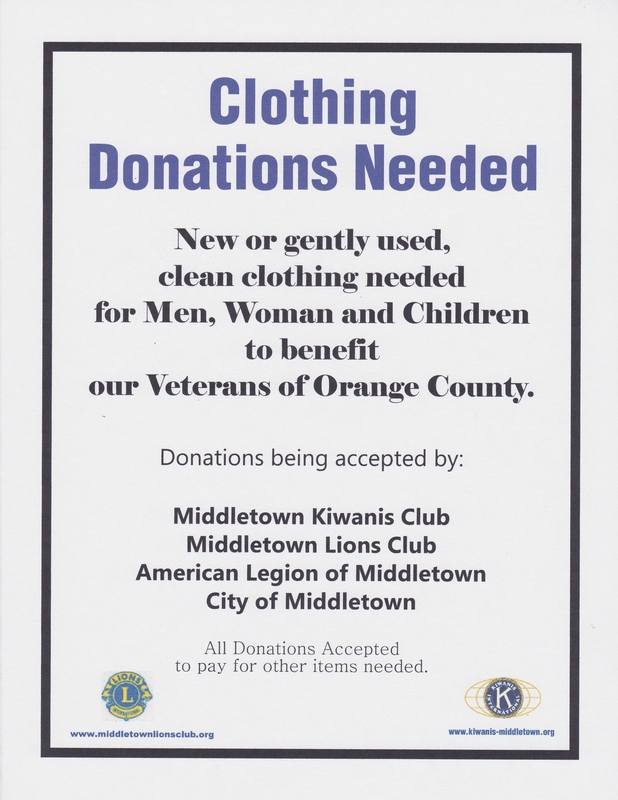 Middletown Lions Club is working with the Middletown Kiwanis Club, Shop Rite, the American Legion 151 and the City of Middletown to collect clean, gently used clothing for our veterans and their families. If you can help, please contact us 845-344-8104. This $1000 scholarship is awarded to a graduating Middletown High School Senior who meets our criteria and is selected by the school's guidance department. Corrinne Jewell, our 2014 Middletown High School Scholarship winner, and her parents were our guests at our July Picnic in the Park. Pictured are President Roy Sheppard, Mr. and Mrs. Jewell, Corrinne, Sight Chair Carole Lybolt and Secretary Glenice Foglia. Corrinne will be attending Russell Sage College in the fall to pursue a degree in occupational therapy. She was a cadet and an active member in MHS NJROTC and held the offices of operations manager and cadet commanding officer. Her commanding officer praised her for her self-discipline, positive attitude and values and an ethic of service before self. A $1000 scholarship awarded to a second year student who is pursuing a degree and meets our criteria. The recipeint is determined by SUNY Orange's guidance department. The Run4Downtown is an annual run/walk/zumba event in the City of Middletown to raise funds for community improvements. Our club has manned water station #2 since the race's inception 9 years ago. It is always held the 3rd Saturday in August and is a very popular event. Middletown Lions Club members donated 50 plus items to this Middletown Cares Coalition annual program to provide kids with the school supplies they need to be successful. Middletown Lions Club members donated warm coats, hats, mittens as well as food items for less fortunate families at Thanksgiving partnering with the Middletown Cares Coalition. 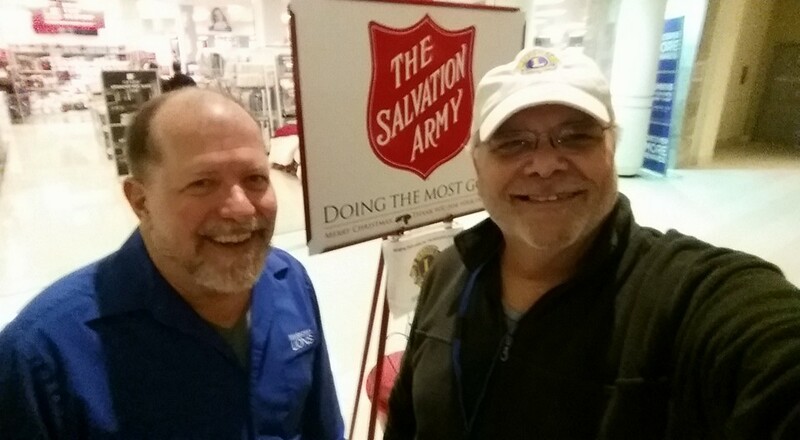 Every year you will find Middletown Lions ringing the bell and collecting donations at the Galleria Mall to help the good work done by the Salvation Army in our area. This is one of our club's favorite community service projects. We are partnered with our local telephone company, Frontier Communicatios via our special friend Karen Miller, who provides us with a bank of telephones at their office (caller ID blocked of course!). 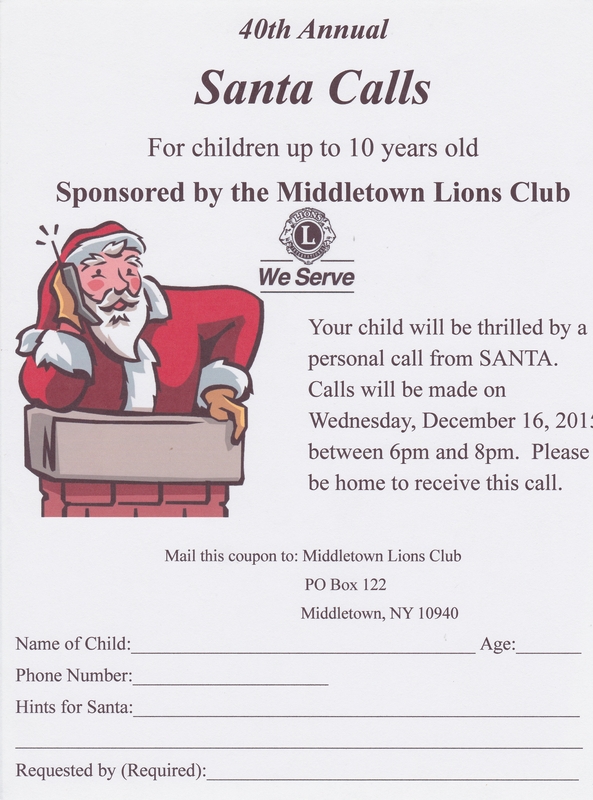 Each year, on the Wednesday before Christmas a team of Lion "Santas" call children whose parents/gandparents have submitted the request. Over the years we have called an average of 277 children each year. Ask our "Santas" about the great conversations they have had with the kids...it makes our holiday. Our female members also participate as "Mrs. Claus, elves and Rudolph" complete with jingle bells.